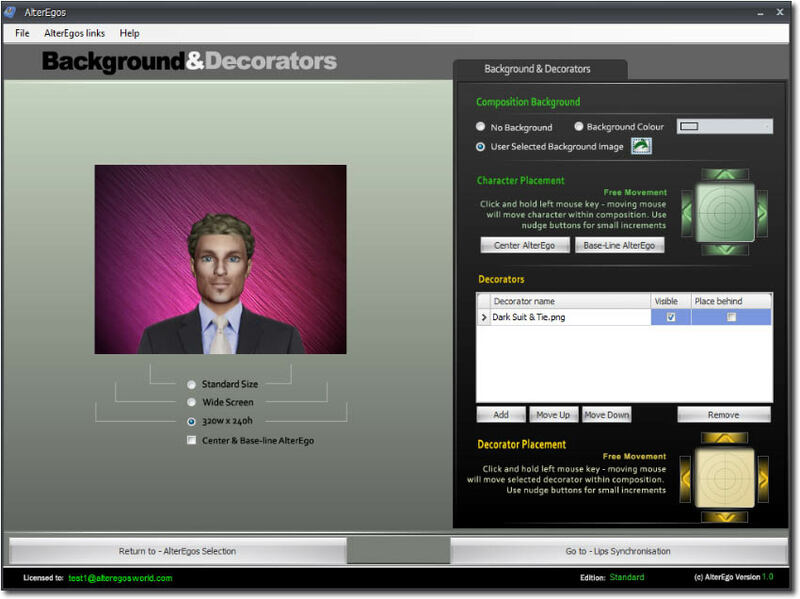 AlterEgos is a desktop PC software solution that allows you to increase the appeal, communication and memorability of your site or media by embedding a fully animated talking representative. AlterEgos generates an industry standard video file that can be simply incorporated within your website, blogg or disk based media in minutes. You simply record your voice, or import a pre-recorded narration, select an AlterEgo and the software does the rest. ...... When it comes to Rapid E-Learning AlterEgos is a perfect partner giving you the edge with your own personal Virtual Teacher. You can have a complete composition on your website in a matter of minutes, with our easy to use Wizard driven interface, no expertise is required, AlterEgos does all the work for you automatically. Presently we have over 80 characters, Male, Female, Fantasy & Animals, with more arriving every month. You can even dress them, change the backgrounds or use your own. AlterEgos can help make your site or media stand out from the crowd. Qweas is providing links to AlterEgos 1.2a as a courtesy, and makes no representations regarding AlterEgos or any other applications or any information related thereto. Any questions, complaints or claims regarding this application AlterEgos 1.2a must be directed to the appropriate software vendor. You may click the publisher link of AlterEgos on the top of this page to get more details about the vendor.